Conveyance, in a rainwater harvesting system (RWH), carries the rain from the roof (i.e. the capture system) to the storage tank (i.e. the holding system). Sounds simple, but it can range from being almost nonexistent to extremely sophisticated and attractive. This article will deal with the simpler solutions. Future article(s) will delve into the more complex alternatives and approaches. The most rudimentary of all conveyance solutions are similar to the design at the right. At Amy’s house all the tanks are above ground and directly under the downspouts. The downspouts have screens over them to prevent large debris from entering the tanks. At the bottom of each of the tanks is a normal hose faucet. This solution requires no pump, no moving parts, and requires little to no maintenance; however, the tradeoff being in almost all installations it requires multiple tanks. Where will the tank(s) be located? Are multiple tanks an option? Are the tanks above or below ground? Is it a new building or is it an existing structure? Several factors influence the complexity of the conveyance system design. Aesthetics is one, and physical property size and layout may be another. For example, the house could be too close to the property line to locate tanks under the gutters, thereby forcing the tanks to be located elsewhere and making the conveyance system more elaborate. Or some of the downspouts may be on the front of the house, and a tank may not be permitted there due to local ordinances, or may not look good there. Because of these or other factors, the tank may need to be situated away from the house, and the conveyance system may need to be a bigger part of the overall system design. Another solution would be channeling rainwater through gutters or piping to one tank. This is also a very simple design, but requires additional gutters or piping to carry the water to the tank. Channeling all the water off the roof is highly encouraged due to the weight and risk of a water leak (Remember: water weighs over 8 pounds per gallon). In a hard rainstorm that quickly drops 1” of rain on a 1,000 square foot roof, the rainwater would weigh well over 2 tons. Equipping the roof with multiple downspouts or paths for the water to quickly drain off the roof is the right design. If it is not possible to locate the holding tank close to the house, many other design options are available. An example is the picture at the right. Jody did not want to locate the tanks next to the house, and chose to make the conveyance system a part of the house design. The gutters are made of very attractive, rust-free galvanized aluminum: not the cheapest alternative, but they become an attractive part of the overall rainwater system and house design. The benefits of this type of system are the simplicity of its design and maintenance. If cost is an issue, baked-enamel aluminum gutters could be a cost-effective alternative. B urying the tank may be the only option in some installations, for example to take into account extremely cold weather or limited space. 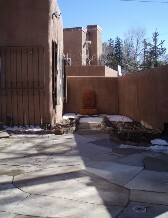 I had no room on my small city lot in Santa Fe to situate a tank, so burial was the only option. The conveyance system for this installation may require underground pipes. The advantage of this type of system is that neither the tank nor most of the conveyance system are visible. The overall system can remain relatively simple, with little required maintenance. However, it does introduce several new factors, and greater care must be given to the design. First, the buried pipes need to slope at least 1 inch for every 4-6 feet of length to ensure water moves through the pipes quickly to the tanks. With burial, some kind of pump will be required to move the water out of the tank. The system costs could escalate prohibitively due to excavation costs (e.g., hard soil conditions or the need to remove rocks). Also, tank costs will be about 25-30% higher due to the need to purchase a tank specifically designed for burial. A combination of above- and/or below-ground tanks is an option that is not typically considered, but should be. An example is the house at the right. Teri’s house has multiple sloping roof angles. Trying to channel the water to one location would require gutters that wrap around the house, in some cases around multiple corners. A much simpler solution would be three tanks of varying sizes - one tank near the front of the house, one on the side and one on the back of the house. Something very similar to this diagram. An alternative to this would be a larger tank near the back of the house, with the combined capacity of the tank on the back of the house and the one on the side. A buried tank in this case would be ideal to ensure that the slope of the underground pipes facilitates proper drainage off the roof and into the tank (i.e., the gutters would have to cut across the face of the house to achieve the same drainage as the buried pipes, which would not be attractive). The benefits of using multiple tanks in this installation are that it greatly simplifies the conveyance system and probably captures more rainwater. But maintenance would be increased because the multiple tanks would need to be regularly checked and cleaned. Another example of mixing the alternatives would be locating smaller tanks orrain barrels under some downspouts and using a bigger tank connected to the conveyance system. How the downspouts are connected to underground pipes can vary. Standard downspout boxes (see picture at right), available at most large-box retail hardware stores, are a simple, cost-effective, and common approach. If aesthetics are important, and efficiency of conveyance is not a critical factor, then rainchains or rock-covered and buried grills are a very attractive alternative (see Related Topics). The materials used for gutters and piping will differ depending on if the rainwater is to be used for drinking. 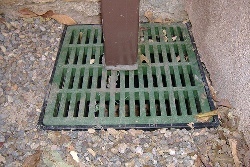 If it is to be used for drinking water, then the gutters and downspouts need to be made of a material approved for potable water (e.g., baked enamel paint on aluminum gutters, or galvanized aluminum), and the pipes should be of a type approved for drinking water (see Related topics). Systems used for drinking water need to incorporate a filtration system designed for that purpose. Sizing the gutters and pipes to the system is another area that needs to be considered, especially in regions with heavy downpours or very low rainfall, where there is a desire to capture as much rain as possible. The slope of the roof may dictate larger gutters, even in areas of light rainfall. This will be covered in another article on Sizing of Conveyance System. In summary, the conveyance system is an area where tremendous creativity and a broad array of alternatives can be explored. This part of a rainwater harvesting system can range from almost no conveyance system to a very sophisticated system using attractive gutters and multiple tanks. With an existing house some of the layout decisions may be fixed, whereas in a new house the options are boundless. Using a combination of rain barrels under some downspouts and a conveyance system with tanks under other spouts can be a very cost effective and simple solution. Be sure to take into account if the rain is to be used for drinking when choosing materials for all system components. Now you have a handle on the conveyance system. There is a little math that needs to be understood and I will cover this in a future article or you can have me do the math for you. The next item to understand is what type and size of tanks you will want to install. 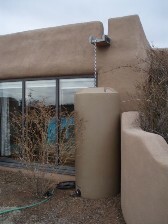 Tanks are generally the most expensive single item of a rainwater system and there exists a multitude of options. Know what type of tank and how big needs careful consideration.